Yes hoopies fans, it’s that time of year again where we cram a little over 3 seasons of Basketball into 3 weeks, 128 games worth of Men’s and Women’s action. Tonight we start with 2 Play In games in the Mid-West and West Regions. Oh and just in case you’ve forgotten what a horrible greedy institution the NCAA is, here’s John Oliver again. Illinois Republican Representative Aaron Shock, he of the Downton Abbey office, announced his resignation from the House of Representatives after questions about his finances and high spending life style. Schock’s spending came under scrutiny after a Washington Post report highlighted the Republican’s newly redecorated office, allegedly modeled after the popular British period drama “Downton Abbey.” The report noted that the office’s decorator, Annie Brahler, remodeled the office for free, sparking an ethics complaint against the congressman. Schock ultimately repaid $40,000 for the redecoration, but the initial story set off a series of reports on the 33-year-old congressman’s lavish spending habits. Subsequent reports detailed a taxpayer funded weekend in New York for his staffers, a dozen charter flights worth over $40,000 on donors’ planes and $24,000 in campaign funds spent on concerts and events, including a sold-out Katy Perry concert. Other reports raised questions over Schock’s relationships with donors. In February, a complaint was filed against Schock over the alleged sale of his home to a campaign donor for a significant profit. And earlier this week, the Chicago Tribune reported that multiple Schock donors were directly involved in a 2014 property deal in which the congressman paid one donor for a commercial property, and then took out out a mortgage for that property from a bank run by other donors. When Rep. Shock was first elected in 2008, he was the youngest member of congress. He is currently the third youngest. In another development, the ex-girlfriend and fund raiser for convicted felon former Rep. Michael Grimm (R-NY11), was sentenced to three months in jail. Diana Durand, 48, plead guilty last September to violating campaign finance law. Despite the recommendation of the prosecutors for no jail time, Federal Judge Sterling Johnson Jr disagreed. Ms. Durand pleaded guilty in September to using straw donors to illegally contribute more than $10,000 to Grimm’s 2010 congressional campaign. Kaplan had asked for no prison time, noting that she’s the single mother of a 16-year-old son. Prosecutors did not object to that request, but U.S. District Judge Sterling Johnson Jr. had other plans Tuesday. Johnson gave no other explanation for the sentence — three months, followed by a year of supervised release and a $10,000 fine. Ms. Durand is slated to surrender to U.S. Marshals in Texas, where she lives, on May 1. Ms. Durand was also accused of giving illegal funds to Rep. Shock. Nor does this bode well for Mr. Grimm who is to be sentenced June 10. Illinois Governor Bruce Rauner (R) has five days to notify the county clerk of the vacancy and the state must hold a special election for Rep. Snock’s empty seat within 115 days. The special election for the NY-11 vacancy is May 5. Ah, the young ans the restless. Nearly all Democrats, and even many Republicans – including potential presidential candidates Sens. Rand Paul, Ted Cruz and Marco Rubio – now agree that inequality is a serious problem. They all profess to be struggling to find ways to address the problem. They spout the usual lines about their pet theories: lack of education and skills among the workforce, robots making workers obsolete and the increasing number of children raised in single-parent families. Yet they will likely stand by and watch as government takes two obvious steps that will increase inequality: the Fed’s raising of interest rates and the signing of free trade deals. While these policies go into effect, which are designed to redistribute income upward, we can count on our political leaders to ignore these smoking guns and round up their usual suspects. Granted, Americans love a comeback story. But it is astonishing how quickly David Petraeus seems to have bounced back from the sordid aftermath of his extramarital affair, which cost him his job running the Central Intelligence Agency and added a rap sheet to the carefully managed legacy of the most famous American general of his generation. Compared with the Obama administration’s aggressive prosecution of whistle-blowers and other leakers of classified information, Mr. Petraeus stands to emerge largely unscathed despite the extraordinarily poor judgment he showed while serving in one of the nation’s most critical national security jobs. How much welfare Uncle Sam provides companies has long been one of the great mysteries of taxpayer spending. Like a secret underground river, boodles have flowed out of the Treasury and into corporate bank accounts without notice. Now we finally have a first look at the size of that river and where the cash goes. The federal government has quietly doled out $68 billion through 137 government giveaway programs since 2000, according to a new database built by a nonprofit research organization, Good Jobs First. It identified more than 164,000 gifts of taxpayer money to companies. You can look up company names, subsidy programs and other freebies at the Subsidy Tracker 3.0 website. A report the organization released today, “Uncle Sam’s Favorite Corporations,” shows that big businesses raked in two-thirds of the welfare. The most surprising and tantalizing finding is the identity of the biggest known recipient of federal welfare. That dubious honor belongs to Iberdrola, a Spanish energy company with a reputation for awful service and admissions of incompetence. It collected $2.1 billion of welfare on a $5.4 billion investment in U.S. wind farms from coast to coast. To many Democrats, the fight the party needs is clear: Hillary Clinton vs. Elizabeth Warren. But the differences between Warren and Clinton are less profound than they appear. Warren goes a bit further than Clinton does, both in rhetoric and policy, but her agenda is smaller and more traditional than she makes it sound: tightening financial regulation, redistributing a little more, tying up some loose ends in the social safety net. Given the near-certainty of a Republican House, there is little reason to believe there would be much difference between a Warren presidency and a Clinton one. The most ambitious vision for the Democratic Party right now rests with a politician most have forgotten, and whom no one is mentioning for 2016: Al Gore. 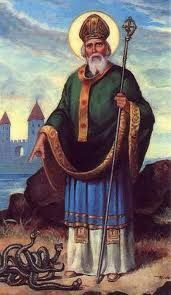 On this day in 461, Saint Patrick, Christian missionary, bishop and apostle of Ireland, dies at Saul, Downpatrick, Ireland. Early Irish settlers to the American colonies, many of whom were indentured servants, brought the Irish tradition of celebrating St. Patrick’s feast day to America. The first recorded St. Patrick’s Day parade was held not in Ireland but in New York City in 1762, and with the dramatic increase of Irish immigrants to the United States in the mid-19th century, the March 17th celebration became widespread. Today, across the United States, millions of Americans of Irish ancestry celebrate their cultural identity and history by enjoying St. Patrick’s Day parades and engaging in general revelry. What use is an album no one will hear? So we’re going NCAA today. Just want to point out that we’ll be covering both the Men’s and Women’s tournaments starting with the Play-Ins. As you know TMC lives on Staten Island and I’ve had a tour. It is really much worse than this. I live 200 feet up the side of a valley. Rain doesn’t bother me though my basement has been known to get a mite damp. Andrew Cockburn is on to shill his latest- Kill Chain: The Rise of the High-Tech Assassins.